Download free demo of Bulk SMS Software for Windows based Mobile Phones software. Evaluation version provides you to enjoy full software functionality by purchasing product at reasonable cost. 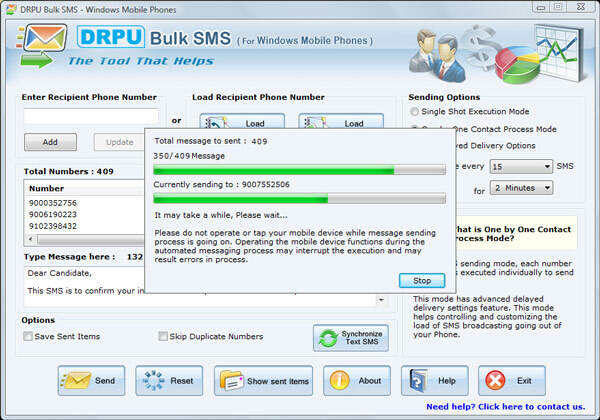 Advanced Bulk SMS Software for Windows based Mobile Phones provides genuine and quickest way to create and send unlimited customized text messages instantly from computer Desktop PC to recipient’s mobile phones via pocket PC or PDA devices in just single click. Bulk sms software is the most effective SMS messaging solution delivering mass SMS to individual, group of people mobile phones subscribed to any national or international network service provider. Reliable and economical to use bulk messaging software is fully capable to send sms related to marketing campaign, job alert notifications, product advertisement, business/product promotions and various business related events/news. Software has self-explanatory interface and a profitable program for all Windows mobile users. Send group SMS from personal computer to various mobile phones. Import phone number list from Text file/Excel file format saved in PC or from phone memory directly. Send items can easily be saved and viewed by the user. Advance facility to skip duplicate phone number entries at time of sending sms. No internet connection is required to send text messages globally. User can send sms in any regional language (Unicode characters). Software is beneficial technique to promote products, job alert notifications, communicating with clients, product advertisement and business promotions. Helps in making easy contact with employees, clients, family members, relatives residing worldwide. Non-technical users can easily use the software without any special guidance or expert knowledge. Windows 7, Windows VISTA, Windows XP, Windows Server 2003, Windows Server 2000, Windows Server 2008, Windows NT, Windows ME etc. Synchronizing your phone with your PC is the best way to transfer information, settings, and files. Synchronization is handled with different applications for Windows Vista, Windows 7, or higher versions of Windows OS. So please check which operating system your PC is running and choose the appropriate option listed below. If computer system is running on Windows Vista, Windows 7, or higher version of Windows OS then synchronization settings will be managed through Windows Mobile Device Center. If computer system is running on Windows XP or earlier then synchronization settings will be managed through Microsoft ActiveSync.